We now return to the present day. Since 1999, however, the Archbishop (later Cardinal) of Buenos Aires, Jorge Mario Bergoglio, has been an honorary member of the Rotary Club, which has ties to Freemasonry and has even been condemned by certain bishops in Europe in the early 20th century. And what is in store for the future? When Father Sebott was asked whether contacts should be carried on, he said: “Not as long as the men [to include Ratzinger] who made the decisions in the 1980s are in office, including the Pope.” This statement may be negative for the present, but bears hope for the future. The desires of the Mason Pohlmann soon seemed to come true: a few months after his article was published, Pope John Paul II died. There followed the 2005 Conclave. Cardinal Carlo Maria Martini (a Jesuit) was among the eligible candidates; it was he who appealed most to the Masons. But it seems that at that conclave, the decisive choice swung between the Archbishop of Buenos Aires, Jorge Bergoglio (also a Jesuit), and Joseph Ratzinger. Ratzinger won (to the Freemasons’ disappointment) and became Benedict XVI, the Pope of Summorum Pontificum, a Pope widely seen as a champion of clear and strong protection of non-negotiable values. Under the Ratzinger papacy, there were frequent media attacks against the person of the pope, in some cases daily, conspiracies of “spies,” leaked documents, criticisms of various theologians against the pope, and massive boycotts of the Motu Proprio Summorum Pontificum. It seems that among the boycotters, or at least among the non-excited observers of Summorum Pontificum, was one Jorge Mario Bergoglio, then-Archbishop of Buenos Aires. The first years of Benedict XVI leave a feeling of increasing crisis in the Catholic Church. Never before, the disagreements and dissensions were so loud inside and outside the Vatican. […] And after Benedict XVI, what? What are the options that arise? Who could lead to a new stage? On February 11, 2013, Benedict gave in to his concerns about his own ability to continue an effective pontificate and resigned. A new conclave was held. This time, when a new pope came out onto the balcony at St. Peter’s Basilica on March 13, 2013, it was the same Jorge Bergoglio who was alleged to be the favored alternative to Ratzinger at the 2005 conclave. The former Cardinal Archbishop of Buenos Aires took the name Francis, the first pope to do so in Church history. Following his election, the relentless media attacks and constant criticisms came nearly to an end, but those who opposed Summorum Pontificum gained new strength. Much talk of “mercy” as the theme of the new pontificate entered the public conversation, but that same mercy seems to have been denied to those “conservative” sectors in communion with Rome. “[…] perhaps in the Church nothing will be as before.” Toward a New Era? Some will no doubt say that this image of Francis in the media as one favored by by Freemasonry is the result of Masonic exploitation and the pope himself has nothing to do with it. This may well be the case. But it is therefore important to ask why the Masons did not similarly exploit or praise Popes Pius IX, Pius X, Pius XI, and Pius XII. It would seem reasonable to conclude that they had little opportunity to do so, for these popes did not give them much to work with that they could interpret favorably toward their ends. 1) After his election, Pope Francis received congratulations and praise from B’nai B’rith, a kind of powerful para-Jewish Masonry for Jews only. B’nai B’rith (B.B.) contends that it is not Masonic, yet its assemblies are called “Loggia” and “Grand Lodge.” B’nai B’rith was founded in 1843 and has drawn its own various elements largely from Masonry. It seems that B’nai B’rith, as an organization, has little or nothing to do with esotericism. To be praised by B’nai B’rith means little; the B.B. showed itself also happy with Paul VI and John Paul II, as well as with Francis. But there is some difference. John Paul II had openly condemned the Freemasons and Freemasonry had not praised him as soon as he was elected. There was some sporadic praise for John Paul II from the Masons after the Assisi prayer meeting [in 1986] — culminating in an award from the Grand Orient Lodge of Italian Freemasonry in 1996 — but not much more. The previously-mentioned anti-masonic condemnation of 1983 had turned off the majority of Masonic enthusiasm for the Polish Pope. 2) On his election day, the information website Impulso Baires transmitted a release of the Gran Logia de la Argentina de Libres y Aceptados Masones; the Grand Master himself, Angel Jorge Clavero, greeted the new Pope Francis and former Cardinal Archbishop of Buenos Aires. The Catholic Church has chosen as Pope the Jesuit Jorge Mario Bergoglio who assumed the name of Francis. A clear-cut choice, away from the logic of the Roman Curia and of the temporal power. From the first moment on, Pope Francis, a man who comes “nearly from the end of the world,” rejecting the ermine robe and gold cross and replacing it with an iron cross, made his first tangible act. In his first words of greeting he fostered a desire for dialogue with the world and with mankind, nurturing the vivid hope for laymen and nonbelievers that change is underway. Maybe this is really what the world expects and what it expected. A new Church that knows how to reconnect love with truth in a confrontation among institutions not entrenched in the defense of their own power. It is that same hope for which the world — and especially Latin America, where the Masons Simon Bolivar, Salvador Allende and the same Giuseppe Garibaldi [especially while in Brazil] among the many who have given liberty to those peoples — has always longed for. A message that Freemasonry itself perceives a sharp break with the past and one which is turned now to listening to the poor, the marginalized and the weakest. To the new Pontiff we send our best wishes for his good work for years to come. Luciano Nistri, Grand Master GLVDI. In January 2017, Luciano Nistri 33° (58 years old, originally from Prato) was reappointed Grand Master of GLVDI for three years 2017-2019. 5-6-7) The Masonic site Fenix News, directed by the Peruvian Mason Mario Rolleri 33° (Lodge Luis Heysen Inchaustegui, Lima, Peru), published on 15 March 2013 a statement from the United Grand Lodge of Lebanon. The Grand Master Rami Haddad and the Sovereign Grand Commander Jamil Saade sent their congratulations to Argentina, to the women of the Female Grand Lodge of Argentina (sic) on the occasion of the election of Pope Bergoglio. In this one statement, we see the support of Peruvian Freemasons (5), Lebanese Freemasons (6) and Argentine Freemasons (7), who were all pleased with the election of Bergoglio. 8) A few weeks after the March 2013 election of Pope Francis, in the April 2013 issue of the Canadian Masonic Newsletter The Watermark, we read that the new Pope is in the Internet, and was even referred to as a Freemason who uses Masonic signs (“a Freemason and using Masonic signs, blah, blah!”) … The writer suggests that one would treat this matter on the level of a chat (“blah, blah!”). The Masonic author is confident that the new Pope, despite his “conservatism,” will be willing to build a better relationship between Catholicism and Masonry. 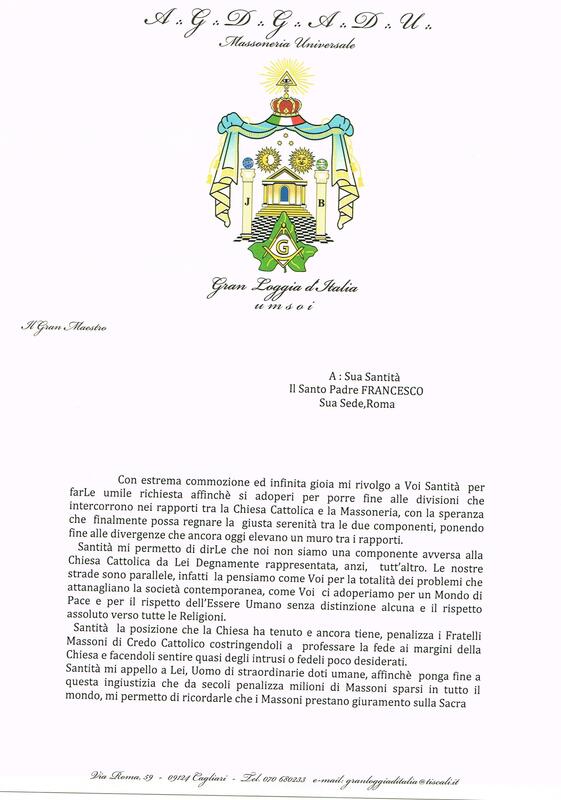 The same article publishes the entire message of good wishes from the Grand Master of the Grand Lodge of Argentina [Ángel Jorge Clavero, see point 2, above] to the new Pontiff. At the end of the Watermark article, the Canadian Mason hopes for a cease of the centuries-old unjust persecution against the Masons by the Roman Catholic Church. 10) In favor of Pope Bergoglio was also the Brazilian Masonic magazine O Malhete. In the article (“Uma lição do Papa“), on p. 7, the Bishop of Rome was being exalted. The author was Derildo Martins Da Costa, Worshipful Master of the Lodge “Luz do Planalto,” East of Serra-Grande Oriente do Brasil. Martins Da Costa writes: “O Pope Francisco, antes de exortar os outros to fazerem, primeiro fez. Aí está Diferença to do Papa Francisco para seus antecessores“, translated: “Pope Francis, before exhorting others to do so, did it himself first. Here is the difference between Pope Francis and his predecessors.” Moreover, Martins Da Costa says that the Pope “seems to have come to give examples” — examples, it is reasonable to conclude, that the Masons find acceptable. In Brazil, in fact, the “Pope has left us a profound lesson of citizenship” when passing in front of an “evangelical church” and deciding to recite an “Our Father” with the shepherds who were at the door. In the last 30-35 years, several Jesuits were in a positive way interested in Freemasonry; they took part in public debates, at conferences organized by the Grand Orient of Italy, have written articles and books on philosophical thought on the history of Freemasonry — in other words, they were ecclesiastical ones who, in spite of the anathemas and the various excommunications of the Church of Rome issued toward the Masonic institution, tried to understand, and then very often ended up sharing the philosophical approach. Humanity today is poorer and poorer, as is also the Catholic Church. But the one of Pope Francis is a church that promises to be respectful of the otherness and to share the idea that the secular state promotes peace and coexistence of different religions. 14) In a two-page letter, dated September 9, 2013, Gian Franco Pilloni, Serene Grand Master of the Grand Lodge of Italy — U.M.S.O.I. (Unione Massonica Stretta Osservanza Iniziatica, founded by Armando Corona, already Grand Master of the Grand Orient of Italy), addressed Pope Francis (one can see that also Pilloni knows that with Francis, the “air has changed” in the Vatican) begging him to work “toward an end of the divisions that exist in the relations between the Catholic Church and Freemasonry.” Pilloni would have us believe that Freemasonry is not an adversary of the Catholic Church, but that it walks on “parallel streets.” Pilloni praises Pope Francis, saying “The Catholic Church is being worthily represented by you,” adding “I appeal to you Holiness, a man of extraordinary human qualities.” Pilloni writes that his Grand Lodge is “recognized by the American Grand Lodges to which I belong” (i.e., Pilloni is also a member of American Freemasonry). Pope Francis launches messages of humanity that are in tune with what we have been saying for years. He also invites people to come out of the catacombs and not to withdraw but to witness among the different peoples to one’s own values [sic], in speaking to society. The reflections should not be limited to today but should build the future. This is a living Masonry, talking to people [in a dialogue]. […] Fortunately, Roman Catholics now have a leader in Pope Francis who believes that all religions and brotherhood associations that believe in God should be respected and not condemned to eternal damnation. We as Christians should heed his call for religious tolerance and for genuine Ecumenism. End of Part One; next part is soon to follow. Montreuil 19755 , p. 159. Pope Clement XIV (1705-1774), Pope from 1769-1774, reluctantly supressed the Jesuit Order universally on 21 July 1773 (see: Dominus ac Redemptor). The Jesuit Order was restored by Pope Pius VII in 1814. Note from the editor. vol., Henri Plon, Paris 1861, pp. 74-75. S. MAGISTER, “Massone, non c’è comunione,” in L’Espresso, 19 August 1999, p. 69 (68-71). ( http://chiesa.espresso.repubblica.it/articolo/7167.html); cf. Gustavo Raffi Gran Maestro Grande Oriente d’Italia, in Erasmo notizie, n° 6-7- 8, 31 March-31 April 2009, Grande Oriente d’Italia, Roma, p. 32. 2006), in Erasmo notizie, Bollettino del Grande Oriente d’Italia, n. 7-8/2006, pp. 42-47. August 2013, of the Grande Oriente do Brasil, Stato dello “Espirito Santo” (GOB-ES). Cf. Corrispondenza Romana, n. 971/03, 6 December 2006; http://www.fattisentire.org/modules.php?name=News&file=print&sid=2294. We read on this site about Braz de Aviz, that “he was named auxiliary bishop of Vitoria in 1994, in 1998 he was appointed diocesan bishop of Ponta Grossa; only four years later, in 2002, he was transferred to Maringá, and in 2004 he was appointed Metropolitan Archbishop of Brasília. A truly meteoric career.” In 2010-2011, he was appointed as the new Prefect of Religious, and soon elevated to cardinal. Giacomo GALEAZZI – Ferruccio PINOTTI, Vaticano massone. Logge, denaro e poteri occulti: il lato segreto della Chiesa di papa Francesco, Edizioni Piemme, Milano 2013, pp. 56-57. Ibid., p. 83 — emphasis added. Erasmo notizie, Bollettino d’informazione del Grande Oriente d’Italia, Anno XIV, Numero 15-16, 30 settembre 2013, p. 11. Erasmo notizie, Bollettino d’informazione del Grande Oriente d’Italia, Anno XIV, Numero 17-18, 31 October 2013, p. 6. “[Interview question:] ‘Your relationship with the Church?’ [Answer:] We pay with an excommunication which is now ridiculous and dates back a hundred years ago. We have always tried to establish good relations. To us we have also had priests affiliated with Freemasonry. We tried to open a dialogue with the Vatican and a few years ago, we had succeeded with a series of letters exchanged with the Vatican Secretariat of State. However, there is a certain rigidity on the part of the Church because of dogmas. We swear on the holy book which is the Bible, we have nothing against the Church. And the Church does not accept the way we think. We do not live with dogmas, instead we like to do our thinking, compare, think. This distinguishes us. The Church has many prejudices against us.” Ibid.